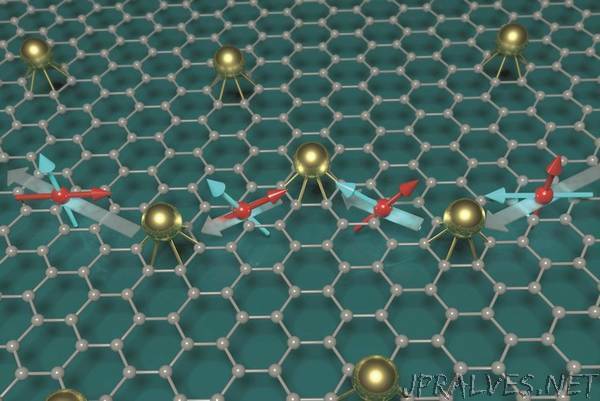 “Graphene Flagship researchers produced graphene-based spintronics devices that utilise both electron charge and spin at room temperature. Demonstrating the spin’s feasibility for bridging distances of up to several micrometres, results open up new possibilities for integrating information-processing and storage in a single chip. From its very inception, the Graphene Flagship programme saw the potential of spintronics devices made from GRMs. Researchers from different universities successfully showed that it is possible to manipulate graphene’s spin properties in a controlled manner at room temperature. These results inspire new directions in the development of spin-logic devices and quantum computing. “With miniaturisation a major driving force behind the electronics industry, graphene opens new possibilities for compacting spin-logic operations with magnetic memory elements in a single platform,” notes Catalan Institution for Research and Advanced Studies (ICREA) Research Professor Stephan Roche, who has been leading the Graphene Flagships Spintronics Work Package since its inception. Graphene extends the area of spintronics inter-device communication from nanometres to micrometres at low energy cost. Although initial theoretical predictions estimated spin lifetimes of around a microsecond in the material, previous experiments have shown a few nanoseconds at best. This puzzling discrepancy initially suggested that the material’s impurities and defects are primarily responsible for spin relaxation. However, Flagship researchers have challenged these conventionally conceived mechanisms of spin relaxation, and proposed several new ones that are unique to graphene. In particular, they observed that the rate at which spins relax in systems composed of graphene and transition metal dichalcogenides (TMDCs) strongly depends on whether they are pointing in or out of the graphene plane. “Graphene interfaced with a TMDC could serve as a spin filter, since the transfer of spin information depends on the initial spin polarisation of the injected electrons, enabling new low-power spin-transistor concepts,” explains Prof. Roche. Importantly, experiments were carried out at room temperature and are particularly important for externally manipulating electron spins in graphene. From studies of the literature, conductance mismatch has been identified as a key factor that could substantially reduce spin injection from ferromagnets into semiconductors. In the device produced, polarisation increased up to 70 % with voltage, challenging textbook wisdom that only ferromagnets can influence spin polarisation. Instead, quantum tunnelling was found to affect spin polarisation in the devices. In particular, spin bridged a distance of 10 micrometres in more than 3 nanoseconds at room temperature.